A primary goal of palliative care is to provide “active total care” and improve quality of life of the person and their family. 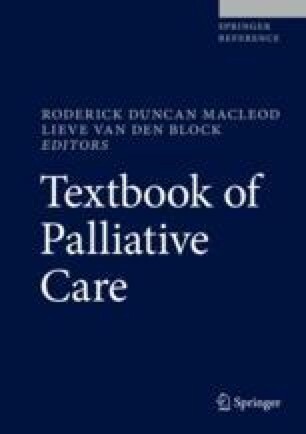 As sexuality is an integral part of the uniqueness and personality of every human being, failure to acknowledge this aspect of an individual in the palliative care context implies failure to acknowledge personhood. Navigating changes in sexual function and relationships is challenging for all people; however, for people who have a diagnosis of life-limiting illness, there are extra challenges and losses. Despite living in the “shadows of impending death,” evidence suggests that the expression of sexuality and the need to connect in an intimate way continues to be an important part of people’s lives, even in the last weeks and days of life. This chapter explores the impact of life-limiting illness on sexual expression and provides some guidance to practitioners in responding to people’s needs. The chapter moves beyond the binary division of gender and heterosexual relationships to discuss the needs of people who identify as LGBT and those who experience disenfranchised grief. While sexuality and sexual expression is a positive force in many people’s lives, for others, it is a source of trauma and distress, and palliative care practitioners need to be aware of issues, such as sexual trauma and sexual disinhibition, and be in a position to create a safe accepting space, where people feel safe, validated, and supported. Marie Curie. Hiding who I am” The reality of end of life care for LGBT people Marie Curie. 2016. [Internet]. Available online: https://www.mariecurie.org.uk/globalassets/media/documents/policy/policy-publications/june-2016/reality-end-of-life-care-lgbt-people.pdf.